May 31, 2013 by Verle L. Bell, M.D. I found you on J.S. Park. Your posts so far, I am reading backwards are very encouraging, right on. One thing, post in the bigger categories, life, love, faith, grace, Christianity, relationships, etc. every time. You will be read much more and you should be. Much love my brother!!! i am not bossy okay. I’ve been blogging for about 2 months and can use a little bossing. I Corinthians 12 says we are all different parts of the body. If the eye says “hey watch out! that semi is headed right at us!” is it being bossy? Well it needs to be. So if God has called you to give useful advice to his servants which enhances his ability to minister in the blogosphere then praise God for you. I have learned to see God bossing me in the advice and even criticism of others. David was criticized by Shimei and saw God in it. Second Samuel 16:5. God called Moses to go save his people and then met him half way to Egypt and threatened to kill him because he hadn’t circumcised his boys. Exodus 4:24 He wants us to serve him with the excellence that his work deserves and that reflects his glory and wisdom. Recently he gave me the gift of claustrophobia so that I could relate to the people I help and so that I could understand that he values the work that I do. He then hauled me before the administrators of my hospital because my notes did not contain enough information. I managed to stay calm by realizing that it was my God who was scolding me and not these others. By the way, my notes are better now. I need to see myself as God sees me, a rough diamond that needs to increase its ability to reflect his glory. 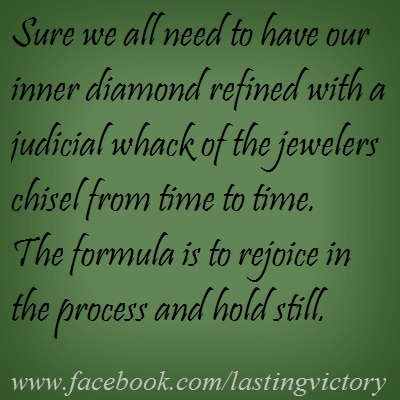 For this to happen I must have my inner diamond exposed with a judicial whack of the jewelers chisel from time to time. I need to hold still in the process or risk being shattered. The question is, “do I trust the jeweler?” But think with me. If there is anything that could possibly happen in this world that you would have the right to resent or fear, then you are reasonable to spend your life anxious. God promises that some of his beloved will be called names, persecuted by their own family, beaten, imprisoned, starved, killed in wars, chased to hide naked in caves, sawn asunder, hacked with swords. BUT IN ALL THESE THINGS I AM MORE THAN A CONQUEROR THROUGH HIM THAT LOVED ME AND GAVE HIMSELF FOR ME. I am learning to seek God’s good intentions in all things and find that peace that comes from remembering that ALL things work together for good in the end. Even if I brought the refining correction on myself but especially if I suffer for righteousness sake. This entry was posted in Uncategorized and tagged abilities, ATTITUDES of peace and power, Christianity, criticism, feedback, gifts, God, spiritual gifts, talents. Bookmark the permalink. Blessed writing. If you go to your home page on your blog. Click that wordpress sign left of your blog name. You don’t have to click anything there, it will go a menu where in the middle it says explore topics. You can see the ones most posted in. Of course there is lots of blogging so we move off the front page of each category quickly. You will get read and followed pretty quickly…….God has given a special gift of writing to you, different gifts for all of us. Your sister in Christ Jesus.